Model: The Lenovo Tab 4 10 is a tablet with a 10-inch screen, two speakers, and monster battery life. It is a great deal for anyone interested in a modest Android tablet. Though it is far from a laptop replacement, if a user is only interested in something for watching a video or casually browsing the internet and wants to pay as little as possible, this hardware specification is good enough. The Lenovo Tab 4 10 has an unexciting but functional aesthetic, with plastic gunmetal-gray sides and a soft-touch dark-gray back that is easy to grip. Its bezels are not very thick, but they do not stand out for being thin, either. At 24.64 x 17.02 x 0.76 cm (9.7 x 6.7 x 0.3 inch) and 0.5 kg (1.1 pounds), the Tab 4 10 is more than light enough to use and carry, but it is a little heavier than its pricier competitors, such as the Asus ZenPad 3s 10 (0.43 kg/0.95 pounds, 24.23 x 16.51 x 0.51 cm/9.5 x 6.4 x 0.2 inch). The Tab 4's relatively thin frame has room for a micro USB charging port, a 3.5 mm audio jack, and a microSD card slot, which lets users add to the built-in 16 GB of eMMC storage. The Tab 4's 10-inch, 1,280 x 800 display is fine for movie watching or game playing, but it does not have the vibrant colors users will find on more expensive tablets. However, despite its relatively low-resolution display, the panel showed fine details. The Tab 4 is not the brightest tablet on the market, but with 307 nits (according to our light meter), the screen is more than adequate for indoor use. The panel is visible under direct sunlight. With its very moderate Qualcomm Snapdragon 425 CPU and 2 GB of RAM, the Tab 4 10 packs a decent amount of power for surfing the web, doing social media updates and playing games. The Tab 4 10 runs Android 7.1 Nougat with a very light Lenovo skin on top. Nougat's split-screen capability made it easy to see two application windows side by side in landscape mode. Lenovo preloads a handful of useful apps and, thankfully, eschews annoying bloatware. Lenovo SHAREit allows you to send files back and forth to other mobile devices or to your PC over Wi-Fi direct. SYNCit HD keeps your contacts, SMS messages and photos synchronized across all of your devices. 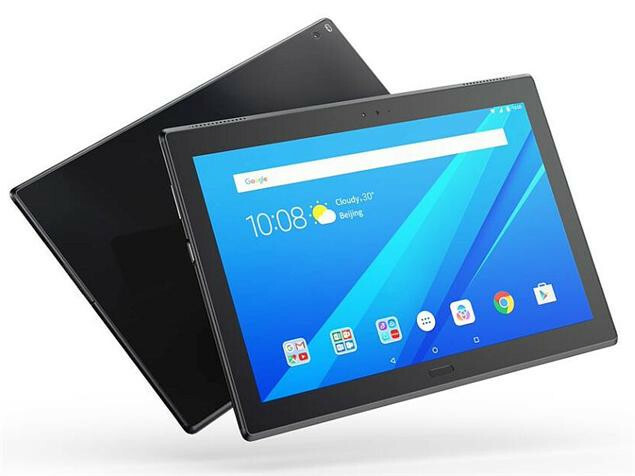 The Lenovo Tab 4's two top-mounted speakers offer a sound quality that is palatable for watching videos or playing games, but if the user wants to listen to music, it is recommended to attach some headphones. The pre-loaded Dolby Atmos app allows to choose a sound profile (Movie, Music, Game, or Voice) and turn on such features as a volume leveller and a dialogue enhancer. 76.04%: This rating is not convincing. The laptop is evaluated below average, this is not really a recommendation for purchase.